httThe first signings for Star Wars: Knight Errant were this weekend, and I was thrilled to have the participation of the Wisconsin Garrison of the 501st in both of them. Bookworld (seen above) in Stevens Point had the first event, Friday evening, and I appreciate everyone who turned out during what developed into quite a snowy evening outside. I appreciate the time that the troopers put in outside; they're real, well, troopers! It was while getting ready for that appearance when news broke that a Lost Tribe of the Sith compilation was on the Del Rey schedule for 2012 (August, tentatively). Details about what's included are yet to be announced, but it's something I've looked forward to us doing. The stories have always been part of a wider arc, and presenting it all under one cover should make for an interesting dynamic. On Saturday, I spoke at the University Ave. 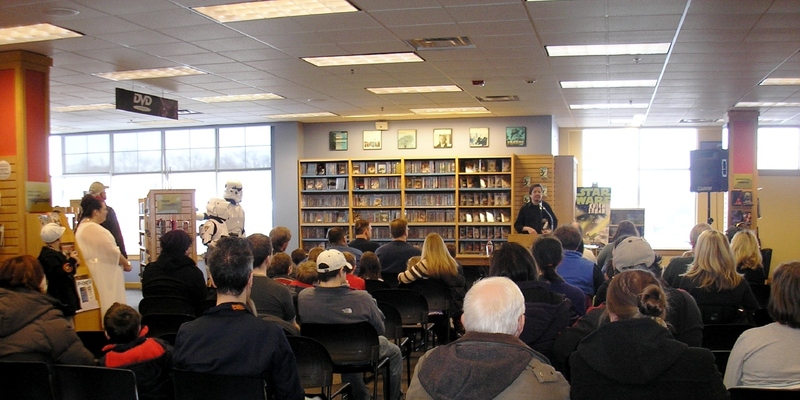 Borders in Madison, and again, there were photo ops for the kids with the 501st members, above. It was the first talk I've given about the book since its release, and I was thrilled at the turnout. Fri, Feb 4, 2-4 p.m. Sat, Feb 19, 1-4 p.m. There have been several more interviews to appear in recent days. Random House's Suvudu site interviews me here, and I also appeared on the French podcast, Star Wars Universe. 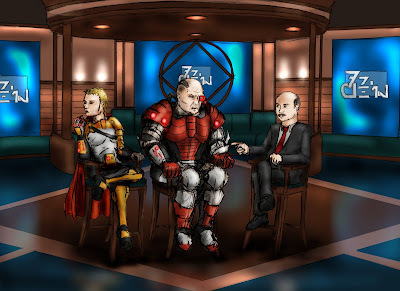 It actually turned out to be a two-parter, about Knights of the Old Republic and Knight Errant; the KOTOR portion is now online, here. I've been getting some very nice feedback from those of you who've read the novel; much appreciated. Peter White was inspired to this graphical response, putting brothers Lord Daiman and Lord Odion on the Dr. Phil show! That's priceless! Don't forget to spread the word, with review posts on bookstore sites, etc. — supplemental art not necessary! And be sure to follow me on Twitter — thanks, Heather, for the spiffy new background! Friday, Jan. 28, 4-6 p.m.
Bookworld 1136 Main Street, STEVENS POINT, WIS.
Saturday, Jan. 29, 2 p.m. Borders 3750 University Ave., MADISON, WIS.
We'll have representatives from the Wisconsin Garrison of the 501st at both events! And speaking of Borders there's a new post in my guest-blog there today — check it out! 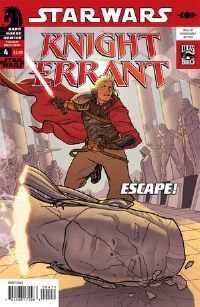 Star Wars: Knight Errant now on sale! Today's the day! 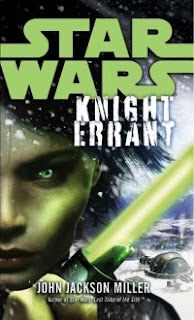 Kerra Holt's journey into Sith space hits full speed in the novel Star Wars: Knight Errant, on sale today! 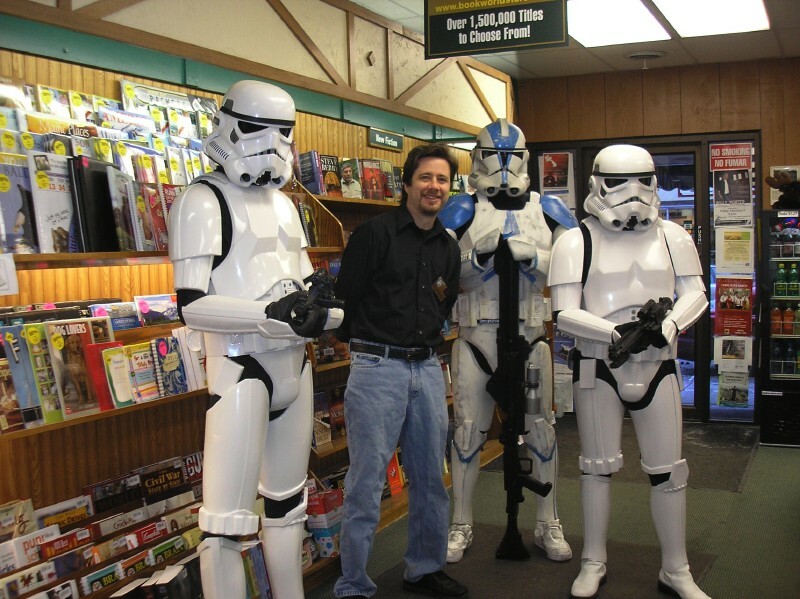 It's a big day — exactly five years to the day after my long-running Knights of the Old Republic series launched. (How cool is that timing?) Remember, this is an original novel, and while it's set after the events of the first comics storyline, you don't have to have read the comics to enjoy the novel — the work stands on its own. And the novel does not spoil the ending of the first comics story, so read away! A few notes on fun extras while reading the book. You can see what Diligence, the warship belonging to Rusher's Brigade, looks like— and you can also look at the map of the sector (as far as the Jedi understood it). There's also a prequel story about Kerra's arrival in Sith space here. Readers new to the site may not have seen the production notes I do for individual works; like album liner notes or DVD commentary, in a sense, I put together a few thoughts about the process and some trivial notes after each work releases. (You can start reading the ones for the Knight Errant comics here.) With the novel notes, I expect they'll go up in stages, as I imagine there will be questions that will inspire some more thoughts I'll want to add to the page. That's it! Please let me know what you thought by responding to this post — and by leaving your comments at the various bookseller sites. And pay a call to one of my signings if you're in the area! Enjoy! Just hours left! Last weekend, I opened the digital floor to questions touching on the Star Wars: Knight Errant material that's appeared so far as it relates to the novel ; with the book on the shelves on Tuesday, here's the final batch of answers. Earlier batches of answers are here and here. Claudio do Santos asks: "What was your inspiration for the character of Lord Daiman and all that talk of 'you do not exist' and 'I created the universe'? It's an interesting vision of the Sith Lords." Since two of the elements of Sith philosophy are the aggrandizement of self and the debasement of others, I simply took that to a logical extreme. In Daiman's case, he's crafted a Sith solipsism that holds that no others exist — and he's made a case in his own mind for it. I considered what would happen to someone who had those thoughts while growing up — and realizing that, because of the Force, he could alter the rules of reality that others have to deal with. He'd only become more convinced that he was something different from everyone else. The novel gets into quite a bit of detail on Daiman's particular weirdnesses, and how they impact the people around him. Nathan asks: "What characters did you draw inspiration from when creating Kerra Holt (ex. : Jaina Solo)? I don't think I really drew from specific Star Wars characters to a great degree. I wanted her to be driven and self-assured — and able to function on her own, making her own decisions on the fly. She probably bears more in common with Jedi-era Luke than anyone in the films: She's got the job, now it's time for her to go to work. Heimir asks: "Will the novel be released in audio book form in the future?" I honestly don't know — haven't heard anything about that. Shey Tapani asks: "Politicians are more or less scum in Star Wars. Are Jedi Chancellors corrupt politicians too? If they aren't, then why does the Republic get rid of them after the war?" The Darth Bane novels get into how the political situation changes, and why; it's not really in Knight Errant's era to address. And since every page of the novel takes place in Sith space, we really see the Republic more through the eyes of outside observers. That was always intentional: Kerra's story is about where she is, and where her heart is. The Republic was just her alma mater! Hirogen Hunter asks: "Let's say someone who picks up the book just watched the movies. Is this a good book for him to read?" I think so. Since this era is new to most readers, we do a lot to set the scene and explain the situation. Anonymous asks: "Will there be a sequel novel to Knight Errant ?" Sequel? I'm still trying to catch up on my sleep! Anything's possible, of course — but you can help the odds by buying the book and spreading the word! One of the things I've been frequently asked about the creation of the Star Wars: Knight Errant novel is what it was like imagining starships without the help of the many talented comics artists I've been privileged to work with. The answer comes in this special piece on StarWars.com: Engineering With LEGOS! I've talked about this process a little here before, in the piece on Knights of the Old Republic #37 -- but in the article you can see both the model for Jarrow Rusher's artillery carrier, Diligence, and the rough schematic that was drawn from it. It's a flying lobster of a ship -- and the trials in keeping it together were always a major element of the novel. Thanks to that Star Wars licensee, LEGO -- and to my young son, Jack -- I was able to know for sure what went where in my descriptions. Knight Errant goes on sale everywhere tomorrow! Darth Malachi asks: "Is Lord Bactra featured in the novel, or is he only alluded to and will be reserved for the next comic arc?" Sith Lord Bactra, neighbor to both Daiman and Odion, was mentioned in the Atlas Supplement. With hours to go until the general release, I probably spoil nothing in saying that, yes, we definitely meet Lord Bactra in the novel. Among others! Shey Tapani asks: "Could you give as a list of species featured in Knight Errant #4? There are some really rare ones in that one — I could not recognise anything expect the obvioius ones." There are many cases where I do not give the artist specific instructions as to which species to use in crowd scenes; this was one of them. So that question really would go to Ivan — he would know better than I would. It's possible that some species may be appearing for the first time; all sorts of refugees wind up stuck in Sith space. Sithoid asks: "Star Wars: The Essential Atlas states that during the dark age the Republic had to face the outbreak of devastating Candorian Plague, and the Holonet was disabled. In Knight Errant, we can see the consequences of the latter, but are we going to learn anything about the very events that made both disasters possible or at least any precise dating?" Under the same principle mentioned earlier about not pinning down things that happened a long time before the events of the novel, no, there's no precise dating. But we do get more deeply into some of the ramifications those historical events had. Rudy Alapag asks: "Who taught Kerra a long time ago?" We've already established that Vannar Treece did, among others: "Influx" tells of how the Jedi, low on personnel, shared duties in teaching students. She was not being trained as a Jedi prior to her meeting with Vannar. Shawn asks: "Will characters introduced in the novel show up in the comic series?" Yes. Sooner than you may think! Heimir asks: "Are all the Sith in this timeline concentrated in the sector the four mini-empires occupy on the map? With the infighting in this sector I was wondering if there are more -ites out there?" The Atlas clearly shows there's a lot of real estate under Sith control, far more than the Grumani sector — and the Atlas Supplement only showed a very small portion of that sector. There are many more out there; Vannar only mentioned in the briefing the ones he knew that he thought might be relevant to Operation Influx. My own map has many more of the blanks filled in, and differs from the published one because, as the map notes, Vannar's information wasn't up to date. Once you read the novel, you'll have enough details for a map that looks a lot closer to mine. Hirogen Hunter asks: "Will the different ship classes be named in this book that were shown in the comics? Will there be an online update on ships and military units and all kind of other stuff a la the Knights of the Old Republic Campaign Guide?" Not all the same ships appear, although I do get into more detail on some of the vessels. I don't know about the possibility of a guide to vessels and units, but I will say that the novel gets into quite a lot of operational detail, especially when it comes to artillery units. This was something I got interested in while working on the Campaign Guide, as a matter of fact: I wrote the section on Republic ground forces, and that started the process that resulted in Rusher's Brigade from the novel. But we will get some additional detail about Rusher's carrier, Diligence — watch for a special bonus to be announced here soon! Some appearances to announce with regard to the upcoming Star Wars: Knight Errant novel release. All are up here in Wisconsin, but then I have some conventions in March — C2E2 in Chicago and Midsouthcon in Memphis. More on those later. 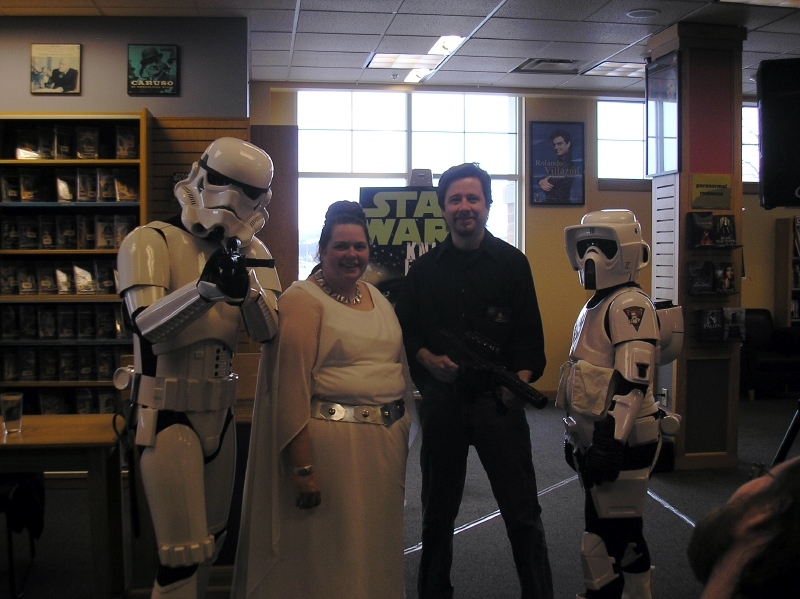 Members of the Wisconsin Garrison of the 501st will be in attendance at the Borders signing (and perhaps others — more details as I have them). If there are more to add in this stretch, I'll post details as I know them. Hope to see you there! Now blogging on Babel Clash! In addition to my posts here, for the next two weeks you can catch me — along with fellow Star Wars authors Troy Denning and Joe Schreiber — blogging about fiction, Star Wars, and other things at the Borders sci-fi blog, Babel Clash. Also, tomorrow, the first issue of my new Mass Effect series with Mac Walters and Omar Francia goes on sale. 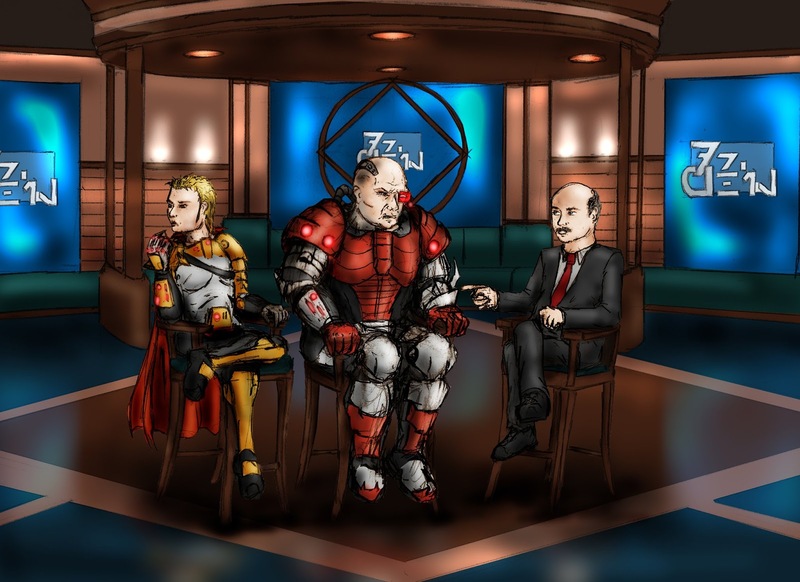 Click to see some sketches and editor Dave Marshall's notes on Mass Effect: Evolution! Finally, a lot of signings are coming together. I'll get them all listed in a post soon. Kenyon asks: "I'm sure this has been covered other places, but does the entire book take place before Influx and Aflame or does it overlap at all?" Barriss Coffee asks: "While at Celebration V you mentioned we'll probably never see something along the lines of a young Lord Kaan, does that rule out the possibility of any connections between this series and the Jedi vs. Sith comics or Darth Bane novels, exclusive of the general political situation (weak Republic, infighting Sith, etc)? Is there a chance a character or plotline from one of those other stories may make an appearance in this series?" We purposefully set Knight Errant well before the big events of 1000 B.B.Y., so as not to collide with anything coming up. The events of that time are momentous, and cast a shadow not only forward, but backward. Partly, I didn't want to repeat the "who's-who-in-the-future" cycle from Knights of the Old Republic. But another reason is that, as we saw in that comics series, you can fit an enormous amount of story real estate into the calendar. The entire fifty-one issue series took a little over one standard year in continuity — and even then, there were a lot of moments in the main characters' lives that we did not see, to say nothing of all the other characters in the milieu. Here, we're talking 32 years — so there's a fair chance that wherever a character like Kaan is, we might not recognize him; he'd have had many potential moments for change over the years. I'd be reluctant to depict such a character in such a way that locks in everything that happens to him in the intervening decades. I'll never say never if there's a story to be told; obviously, I did add to the pasts of characters like Malak and Karath. But if a character would only be used for scenery, I'd probably preserve that character's past for later stories. Jordan asks: "The character Daiman often reminds me of characters from Eastern material, due to his appearance and his personality. How much of your work is inspired from Eastern material — i.e. manga / anime?" I think Daiman's inspirations come from a little further west — Alexander the Great in his own mind, but more like Caligula in practice. Certainly his statuary and some of his architecture recalls classical times. But in terms of apparel, I think we'll find there's a wide mix of influences. In all things, Daiman sets his own style! There are other elements in my work that have been influenced by manga and anime, including some yet to be seen. For the curious, my favorite manga ever is, in my regard, probably also the best original (read as, not licensed) science fiction story in comics: Yukinobu Hoshino's 2001 Nights . Hard science fiction with quality art — the look of some of the ships borders on engineering schematics! Sithoid asks: "How come the Sith are now occupying the southern region of the Outer Rim? Have they lost any connection with their tradition on Korriban etc?" This is one of those things that, if you think about it, would require the current works to speak to the situation across a huge span of time. And that's a little like Lord Kaan in reverse, for me — I'm reluctant to use this work to characterize the broad sweep of events in the centuries before. Now, we do get into the state of things currently, and certainly some of the recent past. But it's clear that a whole lot of history has transpired that is unaccounted for, and I think I would be cautious to get too far outside what characters know from their own lifetimes. Anonymous asks: "What kind of crystal does Kerra have in her lightsaber?" A green one. And that's about all she can tell you about it! The meticulous, painstaking care Kerra put into her choice is touched upon in "Influx". She's a busy woman — she just wants one that works! Knight Errant pre-release: Ask Me Anything! The Star Wars: Knight Errant novel releases in ten days, and while I'm not doing a daily countdown as I did with last year's wrap to Knights of the Old Republic, I will open the floor to questions as I did then — specifically, anything relating to what has already appeared (Knight Errant: Aflame #0-4, "Influx," and the Atlas Supplement). So if you've got a burning question — something trivial or big-picture — click "comment" and ask your question here. I'll collect a few of the questions for a blog post or two later in the week. Again, as with last year, no promises for answers to everything — I won't give novel secrets away, or the end of Aflame. And some things will be reserved for my notes on the novel, anyway. But this is a good chance to get your questions in while you're thinking of them! I'll also be guest-blogging next week on the Borders sci-fi blog, along with Troy Denning and Joe Schreiber. More details soon! Knight Errant countdown: Three weeks to go!